You probably all know how minimal I keep my Android phone setups. My main home screen for years has been a set of apps with custom icons placed below a constantly changing minimal clock widget. From there, I do keep a screen to the left and right of my default for a couple of out-of-sight widgets that I check quite often. To the right has been the stock calendar widget for as long as I can remember. I’ve become somewhat of a calendar addict since starting DL, meaning I can’t function in life nor remember a thing if it isn’t on my calendar. And that leads me to this post, where I think I’ve found a permanent replacement for that stock Google Calendar widget. It’s called Today, and was released well, today. Created by Jack Underwood (known for Now Playing), this simple widget is inspired by a calendar widget idea that the Android team’s Roman Nurik released a couple of weeks ago to G+. 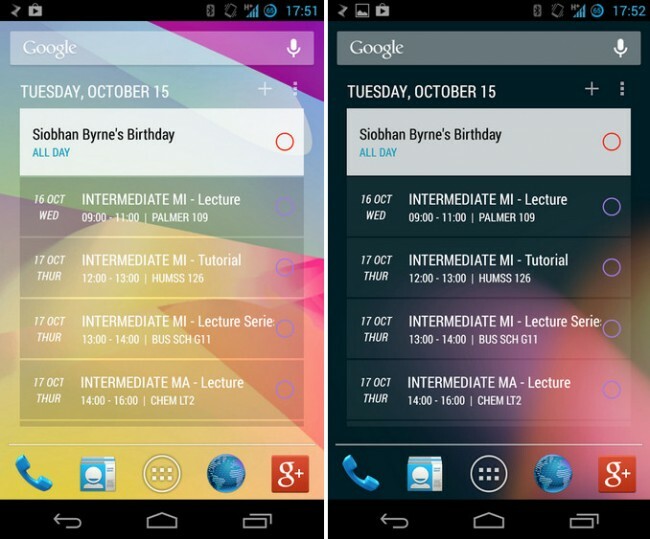 As you can see from the images, it’s a semi-transparent widget that pulls from user-selected Google calendars. You’ll see white-backed items that are happening today, with mostly-transparent items that are on the horizon. You can set the date range for items you’d like displayed, tweak some appearance settings, have it show location info, and even use it with DashClock. It really is simple, but incredibly elegant.